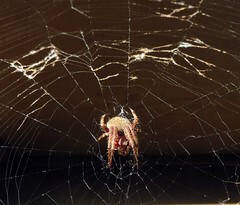 For Halloween this week Mother Nature gave me a treat, or what some might view as a trick, in the form of a large orb-weaver spider, with a commensurately impressive web. The arachnid built its trap from ground to gutter in front of the garage door at Meador Manor, but failed to ensnare any costumed children. Many trees around here are blazing autumn colors, so Wendy and I planned to drive south on Saturday to the Ouachitas in quest of fall foliage. Princess the Camry has been rumbling and shaking more than even her 12 years of use and 210,000 miles of wear should warrant. I suspected a bad wheel bearing, so I took her into a local repair shop on Wednesday, knowing that most of its repairs take an extra day or two for parts. But it took three days for the mechanic to clear his backlog and confirm a dry bearing on the driver’s side rear wheel. Sure enough, parts have to be ordered and won’t arrive until late Monday. So I won’t get the car back until Tuesday, a week after it went into the shop. Wendy has graciously been transporting me to and from school and we used her car, Xanadu the Impala, for our journey south. Having been disappointed on multiple occasions by haze or fog and late autumn colors on the Talimena Skyline Drive, I made her first visit to the Heavener Runestone the focus of our day. 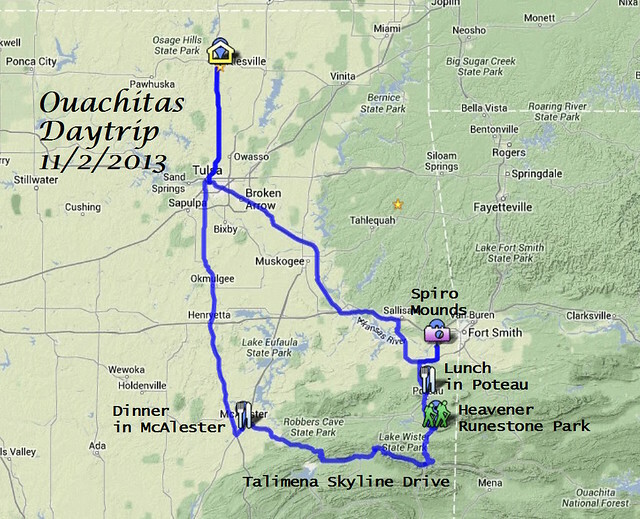 We had a lovely breakfast at Eggbert’s and headed south in Xanadu towards Poteau for lunch. When Wendy spied a sign about the nearby Spiro Mounds, she expressed her interest in visiting the only prehistoric, Native American archaeological site in Oklahoma open to the public. As on my first visit a few years back, she found the mounds underwhelming; they had to be reconstructed after severe looting in the 1930s and later scientific digs sent off the remaining artifacts, so Wendy wants to someday visit Norman’s Sam Noble Museum to see artifacts which were taken from the site by archaeologists from the University of Oklahoma in their excavations between 1936 and 1941. But we had a nice walk around the big burial mound and nearby took some shots of the decaying example of the kind of leader house which was built atop many of the dozen mounds back when this was a thriving Mississippian-culture center 500 to 1,200 years ago. 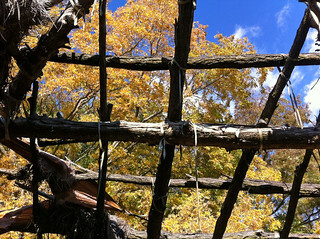 In contrast to the recent reconstructions of a Chickasaw village we saw earlier this month at Sulphur, the Spiro house’s thatch roof is in tatters, exposing the beams, and the walls have been put to use by insects, but Wendy still composed a nice view of autumn leaves through the rafters. We had a tasty pizza at Mazzio’s in Poteau and then drove south to Heavener to tramp 1.7 miles about the very hilly terrain of the former state park. The state closed the park in 2011 due to budget cuts, but thankfully the citizens of Heavener are keeping it open. I agree with skeptics who think it was carved in the 19th century, but the park is a beautiful area to explore, with challenging trail terrain. As we walked along the stone trail down to the runestone, Wendy wondered if the extensive stone railing and walkway were another product of the CCC. I presumed it was, but it turns out the land wasn’t donated to the state until 1965 and opened as a park in 1970. The main stone trail and steps are showing their age but are still in good shape overall. On our way down to the building protecting the large carved stone, we saw Callicarpa, which are appropriately called Beautyberries. After viewing the runes, I took a shot of Wendy in front of the adjacent bluff and waterfall, which we would explore later. We ascended to the perilously steep nature trail, which has an appropriately tilted sign at the other end. The trail surrounding the runestone had oodles of mushrooms of various types all along its length. 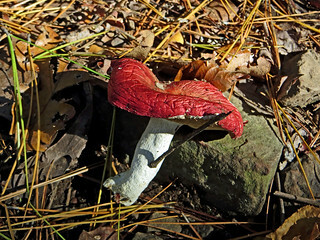 Wendy was adept at spotting them, from Russula emetica (The Sickener!) to a group of fungi with an accompanying ‘pede — I’m not adept enough to distinguish a millipede from a centipede. I spotted serrated ‘shrooms as we trekked up and down the steep hillsides and across dry streams with tumbled slabs of stone. We climbed the steep grade to the other end of the nature trail at the visitor center, where I posed out on a rock projection, and then walked along the road uphill to what I knew was a bluff providing westward vistas. 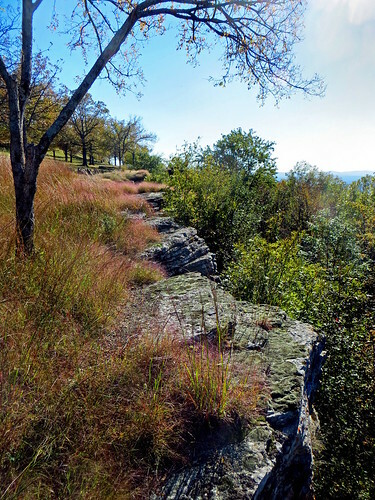 I located the overgrown trail on the west side of the road which led over to and along the bluff; this is a lovely walk with great views of the rocky bluff, its lichens, and great views, so it is a pity the trail is not being maintained. We reached the mowed overlook area with its winding rock walls and enjoyed the panorama, wildflowers of various sorts, and the trees scattered and leaning about the park. I led us down and across the road to find the trail leading back to the runestone. Along the way Wendy spotted a large golden fungus growing in a stump. Back at the runestone, Wendy walked over to examine the waterfall pool while I shot the stream and we poked around the eroding shale bluff with its fallen blue and gray stones and cracked surface, with Wendy composing a nice shot of leaves amidst the damp stone. We ascended the steps toward a final blaze of autumn color to return to the car. We then drove south to follow the Talimena Skyline Drive westward against the sun, but haze obscured the views and many of the trees had not yet turned. This made the drive slinking along the ridge more fun than the panoramas. Dinner at Krebs/McAlester was a bust, with such slow service at Isle of Capri that we left, only to find Pete’s Place too crowded and Patron Mexican Grill rather dirty. Our very late return to Bartlesville was ameliorated by the shift out of Daylight Savings Time, giving us back an hour. We had a lot of fun at Heavener and hopefully can make it down to the Ouachitas later this fall for more hiking…without Vikings.